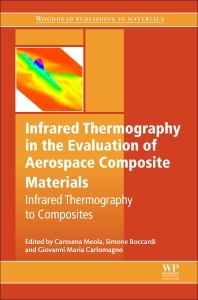 Infrared Thermography in the Evaluation of Aerospace Composite Materials: Infrared Thermography to Composites provides an update on infrared thermography, a fast and reliable method for non-destructive evaluation of composite materials used in the aerospace field. The book describes composites and the main problems that can arise both during manufacturing and when in service, and then covers different thermographic non-destructive testing and evaluation techniques, including pulse thermography, lock-in thermography, and pulse phase. Each technique includes key examples and relevant references, with sections devoted to the usefulness of an infrared imaging device to monitor the behavior of a material under load, such as impact and bending. The book also includes discussions on standards, personnel certification, and training. Carosena Meola is a senior research staff member in the Department of Aerospace Engineering, University of Naples Federico II, Napoli, Italy. Simone Boccardi is a PhD Student in the Department of Industrial Engineering - Aerospace Division at the University of Naples Federico II, Naples, Italy. Giovanni Maria Carlomagno is a Professor in the Department of Industrial Engineering - Aerospace Division at the University of Naples Federico II, Naples, Italy.